The presented room availability, rates and discounts are actual and final for all our 74 hotels in Baden-Baden. 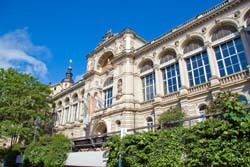 Baden-Baden is founded on hills at the bottom of the Black Forrest. The town gained its popularity mainly thanks to healing baths and hot springs that is clear already from its name. Baden-Baden happened to be extremely lucky as it remained untouched by WWII bombs and is still amazing people by its luxurious villas and mansions and avenues with lines of beautiful trees.